Coach's Corner - San Diego Chargers Greats multi signed/full size football, by 13! Go Back to Lot List San Diego Chargers Greats multi signed/full size football, by 13! 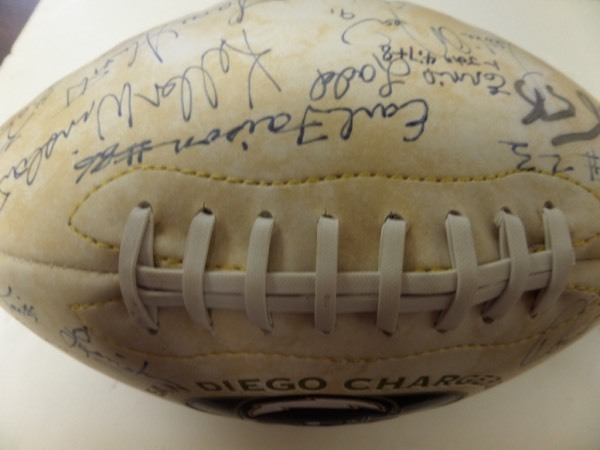 This San Diego Chargers, Established 1960 team logo 1/2 white panel football is a limited edition ball of 10,000, in NM condition, and features team championship info. It is hand-signed by 12 of the greatest to ever play for the franchise, plus longtime team owner George Pernicano. Included are HOF'ers Dan Fouts, Lance Alworth, Kellen Winslow, Ron Mix, Charlie Joiner, Junior Seau, and notables, Leslie O'Neal, Paul Lowe, Chuck Allen, Keith Lincoln, Earl Falson, and Ernie Ladd. With 5 now deceased, and super duper HOF star power, this MUST HAVE Chargers collector's item is valued well into the mid/high hundreds!